The whiskerDocs veterinary team is comprised of pet health experts. 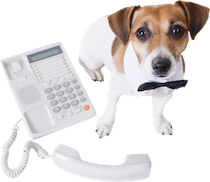 Our team is based in the U.S. and is here to help with pet problems you may have, 24 hours a day. Dr. Anna has over 20 years of experience in the field of veterinary medicine since graduating from the University of Illinois in 1990 as a Doctor of Veterinary Medicine. She has lived and worked in the Chicago, Illinois area since 1980, when she started her career in veterinary medicine as a receptionist and technician in a local vet clinic fresh out of high school. Dr. Anna explains that, "I decided to become a veterinarian when I got that first job. It was there that I saw all sorts of people and animals and learned that solving the puzzle of “What is wrong with this pet?” was both challenging and rewarding." She completed her education and went on to work for a number of small animal hospitals in the Chicago area as an associate and/or relief veterinarian. Dr. Dawn has been a veterinarian for more than 20 years, practicing companion animal medicine since graduating from The University of California at Davis in 1995 with her Doctorate of Veterinary Medicine. She was later certified in Animal Chiropractic in 2002. In 2012, she received an opportunity to move back to her childhood home state of Virginia, where she now lives in and works on a hundred year old farmhouse with the "help" of 3 English Setters, 1 Labrador Retriever, 2 cats, 3 Trakehners and 1 Paint horse, 5 peafowl, 1 cockatiel, and an assortment of chickens. Beth is a veterinary technician, graduate of Harcum College in 2007, who is currently living and working in the Tampa, FL area. She worked for 7 years in Pennsylvania at a veterinary hospital as she went through school before moving to Florida and working there, during which time she learned many important pet care skills and about the many ailments that can plague our animals and the ways to help support parents in making the best decisions for their animals. She also has significant experience with non-profit rescue groups and, during her work with this group, she served as a liaison between veterinarians who cared for foster animals and the foster parents and helped to create care protocols for the animals within the rescue’s network. Dr. Tracey is a graduate of Auburn University with a Bachelor of Science in Zoology. She attended Tuskegee University and graduated with honors from their College of Veterinary Medicine in 2002. After graduation she returned back to her hometown in North Alabama and opened her own small animal practice. She owned this practice until she sold it in 2013. After doing relief veterinary work she started with WhiskerDocs in December of 2014. She now lives in Georgia with her husband and 2 children. They have 4 dogs, 4 cats, 2 guinea pigs and 2 leopard gecko's. My desire to become a veterinarian started when I was very young, and has never wavered. My love of animals started with my early obsession with horses, and according to my mother, my first word was “horse.” As a child I became more involved with horses, including having one of my own, and got my first exposure to a veterinarian as he worked with us on our wellness program. Needless to say I was “hooked” on becoming a veterinarian from the start. Growing up we also had dogs, barn cats, birds, hamsters, frogs, and a turtle. Our first dog came from Santa when I was in kindergarten, and was a part of our family until I was in college. In high school we added a chocolate lab to our family, who was my closest companion and riding buddy throughout college, and veterinary school. Since veterinary school I have been practicing in rural areas in mixed animal practice, and have always valued client interactions, and enjoyed helping people become more involved with their pets health and medical care. When the opportunity came to become part of the WhiskerDocs team, I jumped at the chance to continue my passion for helping people, and furthering education for pet owners. Dr. Fink graduated from the University of Missouri College of Veterinary Medicine in1986, and promptly moved to Orlando to get warm! She has been practicing dog and cat medicine for over 30 years. Since graduation, she has received extensive additional education and experience in clinical field studies, dog obedience and agility training; canine and feline reproduction, dermatology and behavior. Dr. Fink has enjoyed being a guest teacher at her local elementary and middle schools. She has coached children in soccer and basketball, and mentored many students aspiring to be veterinarians. She was the owner of Hiawassee Veterinary Clinic and then West Orange Veterinary Hospital for a combined total of 23 years, but has since given up the stresses of practice ownership for employment with whiskerDocs! Dr. Fink is currently serving a three year term on the University of Florida College of Veterinary Medicine Admission Committee and also volunteers for the Florida Veterinary Corps who respond to disasters, like hurricanes, to help animals in need. She is a member of the AVMA and the FVMA. She does volunteer photography for her daughters’ high school athletics and is currently the Team Mom for the girl’s varsitysoccer team. In addition to Veterinary Medicine, she enjoys salt-water fishing and SCUBA diving. Dr. Fink doesn’t miss managing her practices at all! What she misses is the 30 years of building relationships with people and their pets. She watched family pets come and go while children grew up and elderly clients retired. She experienced the joy of new puppies and kittens and the agonizing grief of their loss after they grew old and tired. At whiskerDocs, Dr. Fink can still have the gratification that comes from helping to solve a pet health or behavior problem and teaching pet parents how to take care of their four-legged children whom they love as much as their two legged ones. She doesn’t get to place her hands on her furry patients anymore, (sigh), but her own dog sits by her on every work shift, just in case she needs a quick snuggle or lick in the face! Dr. Adele Hilliard originally hails from ‘across the pond’ in Leicestershire, England. She moved to South Carolina at the age of 11 and received her Bachelor of Science degree in Animal and Veterinary Sciences from Clemson University. After completing her undergraduate studies Dr. Hilliard received her veterinary degree from the University of Georgia in 2014. Prior to, and during her time at Clemson and Georgia, Dr. Hilliard was highly involved in shelter medicine. She spent numerous hours at various adoption agencies working closely with animals and educating the public. She was also highly involved in the Shelter Medicine Club, coordinating all Shelter Medicine Surgery Activities with the students at Georgia during her junior year. In addition to shelter medicine, Dr. Hilliard pursued other interests including nutrition and behavior, and was involved in many organizations such as the Vets for Pets and People (an organization aiding abused women), Christian Veterinary Fellowship, and the student chapter of the AVMA. After graduation, Dr. Hilliard moved west, and worked in both Wyoming and Colorado. In these two positions she had the chance to be involved in general and low cost veterinary practices, in addition to shelter settings serving the surrounding communities. Although Dr. Hilliard loves many components of veterinary medicine, one of her favorite aspects is talking to the public and helping to educate them about their pets. WhiskerDocs allows her to easily have this connection with the public and she greatly looks forward to talking with clients and answering any questions they may have. Dr. Hilliard is extremely blessed to have an amazing husband, Austin, and has a wonderful one-eyed dog named Koda. The family spends much of their time at both cycling and car racing events, as well as camping and hiking in the mountains. In addition, Dr. Hilliard and her family love spending time outside, with Koda racing around the yard as much as possible and “helping” around the house; he especially loves to keep the clean clothes warm by lying on top of them. Dr. Hilliard also greatly enjoys cooking and baking, as well as antique shopping for her home. Dr. Hilliard and her family are expecting their first child, a little girl, in February of 2016. Sharon Johnston is a Registered Veterinary Technician with over 17 years of experience in small animal medicine. She graduated from Stautzenberger College in Toledo, OH with an Applied Associate Degree in Veterinary Technology in July of 2000. She has worked for the same veterinary hospital, Paw Patch Veterinary Services, Inc, since July of 1998, where she works as both the hospital administrator and a veterinary technician, with extensive experience in all aspects of small animal medicine. Her passion for animals also led her to becoming a co-owner of her own business, Pampered Paws Companion Services, LLC, where she serves as a Certified Canine Massage Practitioner and Pet Care Provider. She does in-home pet sitting, nursing care, canine massage, and provides transportation services. Sharon feels passionately about educating pet parents about proper care and taking preventative measures. She says, "My career as a veterinary technician stemmed from a passion to work with and care for animals. Over the years, I have come to realize that one of the most important ways to do this is to aid and educate their guardians. Working with whiskerDocs enables us to reach pet parents all over the country." Barbara Kocis has been a licensed veterinary technician for nearly 20 years and has worked in various small animal hospitals since 1990. Amazingly enough, she managed to obtain her veterinary technician license in 1996 while simultaneously having 3 children, a husband, a dog, a few cats, some fish, lizards and snakes, and getting pregnant with child number 4. Barbara has been working in the field of Emergency and Critical Care for the past 20 years. Working the overnight shift gave her the opportunity to still be at home with the kids during the day. When she wasn't in the ER, off time was spent working part time for a surgeon, as well as spending time with family and friends. Camping, going to the beach, doing crossword puzzles, playing the guitar or piano are some of the fun things she and her family enjoyed. Her most recent love is riding her Harley. With kids now grown, suiting up and riding into the sunset (or visiting grandchildren) is the best stress reliever yet. When asked about her choice to join the whiskerDocs team, Barbara explains, “One of the best decisions I have made was to become a Jungle member for whiskerDocs. I enjoy talking with people and helping them make the best decisions for themselves and their pets. It also allows me to spend time at home, taking care of my family, while helping pet parents care for their furry friends.” Her best friend, 14 year old Dane/Boxer mix, Auggie, recently passed away, will always have a special place in her heart. Alexandria, also known as "Tai", has been a Licensed Veterinary Technician in the state of Alabama since her first college graduation 2004. She also holds a degree in Medical Laboratory Technology, a division of human medicine. She was born in Germany on a Military Base and has lived in various locations across the country. She is currently Lead Veterinary Assisting Instructor for Ross Medical Education, at the new campus in Huntsville, AL. Most recently she worked at a US Army Veterinary Treatment Facility assisting with Military Working Dogs and training soldiers. She has experience in emergency and critical care as well as general practice, and has even worked in an FDA regulated manufacturing laboratory testing human plasma specimens for an international pharmaceutical company. She enjoys spending her free time working with No-Kill Rescues, riding horses, and just hanging at home with her personal zoo of dogs, cats, lizards, and even back yard chickens!! She has chosen to join the WhiskerDocs team because it gives her an opportunity to help animals across the country and alleviate the worry pet parents feel when one of those “middle-of-the-night” incidents rears its ugly head! Jennifer began her veterinary medical journey at the age of 16 when she worked for a mixed animal veterinary practice. Upon completion of high school, she attended the University of Cincinnati, studying Art History. After four quarters at UC, she felt that she was not on the correct life path. So, she looked into her options and decided the best route for her was to enter into the field of veterinary technology. Jennifer attended The Vet Tech Institute at Bradford School in Columbus, Ohio and graduated with an Associates of Applied Science in 2012. She has extensive equine experience, and has worked in both private practice and emergency medicine. Jennifer's most recent career endeavor included teaching veterinary technology classes at an accredited vet tech school. She currently resides in Ohio with son, her Weimaraner, two cats, and two rats. Jennifer is a full time student at Wright State University, studying Earth Science, and she is also a yoga teacher in training. Tamar has been a veterinary technician for 22 years. She obtained her veterinary technician license in 2005 from the state licensing board in Georgia while obtaining her Master's of Science in Biology. Tamar has a diverse background in veterinary medicine, starting as a kennel assistant at her first job and moving on to become a receptionist at the same veterinary clinic and then a veterinary technician. Tamar moved on to become a education specialist, avian trainer and docent supervisor at a zoo. Her next career step was working as an intensive care unit technician at a large referral veterinary hospital. She went on to specialize in surgical technology while working at a veterinary referral surgery practice and then moving on to become the surgical supervisor at the largest corporation of veterinary hospitals in the US. Christina started off at a very young age taking care of every creature she could come in contact with, and grew quite the reputation of being the town animal caregiver. Living on a farm she had the unique opportunity to get into rehabilitating wildlife along with many types of domesticated animals. Throughout the years as she grew up and her experience grew she started acquiring a specialty for handling carnivorous predators. Such as, wolves, wolf-hybrids, coyotes, racoons, and many other species. Wanting to be able to provide more of the hands on vet care, she made the decision to become a licensed veterinary technologist and put herself through school by teaching horse back riding lessons and training horses. After graduation she went into clinical practice, and worked there for over 10 years. During that time she attained her specialty in behavior, working primarily with dogs, cats, and horses. As her love for behavior grew along with her need to continue improving in her overall knowledge and skills, she decided to make the change from clinical medicine to research medicine. Christina has lived in Gainesville, Florida with her husband and 2 dogs for over 4 years now. She currently works at the University of Florida, specializing in cardiology and myology. Dr. Kate is a licensed veterinarian in the state of Hawaii. Dr. Nicole is a licensed veterinarian in the state of Georgia. Dr. Cole is a licensed veterinarian in the state of South Carolina. Dr. Carolyn was born and raised in Philadelphia, Pennsylvania and knew ever since she was 8 years old that she wanted to be a doctor that took care of dogs and cats. She always took care of the family pets and loved visiting her local veterinarian. She also volunteered at many shelters and eventually took a job at an animal hospital as a veterinary assistant for 4 years. Dr. Carolyn decided to attend college in Philadelphia even though I moved to South Jersey in the middle of high school. She graduated from Temple University with a Bachelor’s of Science in Biology and a minor in Philosophy, and then graduated from the University Of Pennsylvania School Of Veterinary Medicine in 2010. Dr. Carolyn has been working in small animal medicine for 7 years and says she just can’t imagine myself doing anything else. She currently resides in Central New Jersey with my high school sweet heart husband of 18 years, my 8 year old daughter, my 3 year old son, 5 year old Shih Tzu mix and 12 year old DLH (cat). Dr. Michele is a licensed veterinarian in the state of Texas.